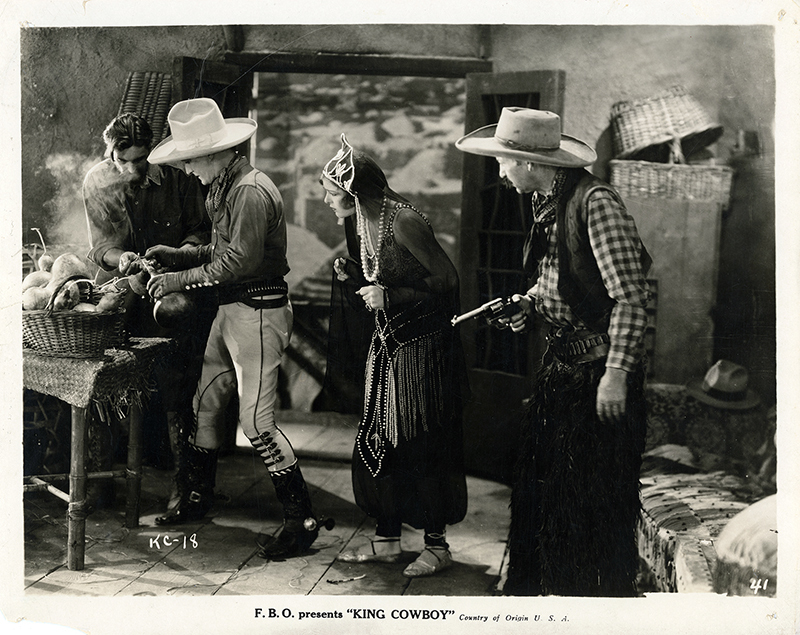 8x10 BW publicity still, with pinholes indicating use as a lobby card, for FBO/RKO's 1928 Tom Mix vehicle, "King Cowboy" (his nickname). Copies of a trailer exist, but it's doubtful the film survived. FBO Pictures. Distributed by RKO Productions, Inc. Released November 26, 1928. Length: 7 reels (6,269 feet). Production Started: August 9, 1928. Production Completed: August 25,1928. Producer: William LeBaron. Director: Robert De Lacy. Screenplay: Frank Howard Clark. Story: S.E.V. Taylor. Titles: Helen Gregg and Randolph Bardett. Assistant Director: James Dugan. Film Editors: Henry Weber and Tod Cheesman. Photography: Norman De Vol. Cast: Tom Mix (Tex Rogers), Sally Blane (Polly Randall), Lew Meehan (Ralph Bennett), Barney Furey ("Shorty" Sims), Frank Leigh (Abdul El Hassan), Wynn Mace (Ben Suliman Ali), Robert Fleming (Jim Randall). Note: A preview trailer for King Cowboy was available in 16mm and 8mm film on the collectors' market some years ago. "One of the best westerns seen recendy and above the average Mix quality. A natural for any house that can stand westerns and strong enough to fill in on the split weeks. "Conventional but appealing story of a band of cowboys on an expedition in Africa [sic] in search of their missing boss. Daughter of the missing man accompanies the outfit Plans show the layout for oil fields involved and are responsible for the capture of the American by the African Amir. Resultant harem scenes carry a few laughs. "Captured by the Amir and deprived of all firearms, the cowboys are virtually at the mercy of the African despot until they stage a midnight raid on the arsenal, recover their guns, and start a war following a rodeo given for the Amir's pleasure. "Sally Blane is attractive as the heroine. Good support all around for Mix and scenic settings are lavish." LW2864: 9600 dpi jpeg from original photograph purchased by Leon Worden.